Cyti Web is the PUP that uses misleading techniques to prevent removal. Use Reimage to locate malicious components and get rid of them faster than with uninstall instructions. A full system scan blocks virus reappearance and prevents traffic to malicious domains. How can Cyti Web hijack my computer? How to remove Cyti Web virus? Cyti Web by SuperWeb LLC is an ad-supported application that is responsible for delivering commercial and non-commercial advertisements in order to drive visitors’ traffic to sponsored websites. It has been aroused various discussions among reputable security vendors due to the fact that it is distributed bundled with free software and has even been categorized as an adware and a potentially unwanted program (PUP). If you have already visited its official websites, at first you may think that this app is reliable. It tries to convince people that it is capable of enhancing user’s web browsing experience by delivering various discounts, coupons, promo codes, etc. in a form of pop-up, banner, in-text ads. Unfortunately, Cyti Web virus has been developed by SuperWeb LLC, which is well known for the development of suspicious apps that all act in the same way. The biggest problem that developers of this app do not take any responsibility for the activities of third parties. More specifically, they do not monitor ‘Ads by Cyti Web’ and do not check their content. As a consequence, by clicking on them people risk their own security and may expose their computer to various cyber threats. In order to avoid Cyti Web redirects you should ignore those pop-up ads and run a full system scan with Reimage as soon as you start receiving them on Google Chrome, Mozilla Firefox and Internet Explorer. There are two ways how Cyti Web virus can get inside, i.e. after downloading it from its official website or after accepting its installation when installing other freewares. No matter how it manages to get inside your computer, it should be removed as soon as possible. It may slow down your computer, redirect to unsafe websites, deliver annoying advertisements, cause infiltration of other potentially unwanted programs and so on. Be very careful and always keep in mind that software bundles are widely spread on various download websites. It’s very important to avoid installing bundles because in most of the cases ‘optional download’ appear to be suspicious programs, such as adwares or browser hijackers that later cause various issues on infected computer. If you have already installed Cyti Web virus, do not delay its removal because not only its ads are annoying, but due to the fact that it may try to promote useless, bogus, invented or malicious products and programs. In order to get rid of additional components that travel along with freewares, you have to select Advanced or Custom installation option and unmark check boxes stating that you accept to install programs, such as add-ons, plug-ins, toolbars or extensions. If ‘Ads by Cyti Web’ and similar pop-up notifications have already started bothering you, you shouldn’t wait until they redirect you to suspicious websites. In addition, this program may start tracking your browsing activity, search terms and similar data that is considered as personally non-identifiable. If you want to avoid its loss and consequences that may appear after revealing it for unknown third parties, you should follow the guidelines that are given below and remove Cyti Web adware right away. Here, look for Cyti Web or any other recently installed suspicious programs. 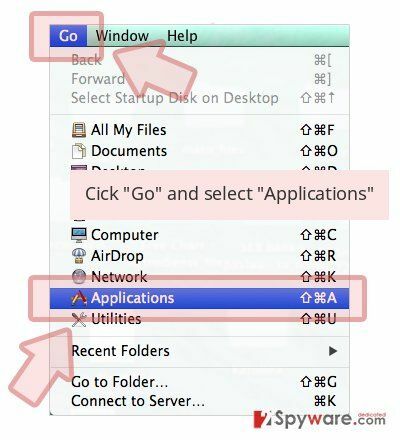 Wait until you see Applications folder and look for Cyti Web or any other suspicious programs on it. Now right click on every of such entries and select Move to Trash. When in the new window, check Delete personal settings and select Reset again to complete Cyti Web removal. Once these steps are finished, Cyti Web should be removed from your Microsoft Edge browser. Here, select Cyti Web and other questionable plugins. Click Remove to delete these entries. Now you will see Reset Firefox to its default state message with Reset Firefox button. Click this button for several times and complete Cyti Web removal. Here, select Cyti Web and other malicious plugins and select trash icon to delete these entries. Click Reset to confirm this action and complete Cyti Web removal. Here, select Extensions and look for Cyti Web or other suspicious entries. Click on the Uninstall button to get rid each of them. Now you will see a detailed dialog window filled with reset options. All of those options are usually checked, but you can specify which of them you want to reset. Click the Reset button to complete Cyti Web removal process. This entry was posted on 2015-10-02 at 05:47 and is filed under Adware, Viruses. You can quickly scan the QR code with your mobile device and have Ads by Cyti Web manual removal instructions right in your pocket. 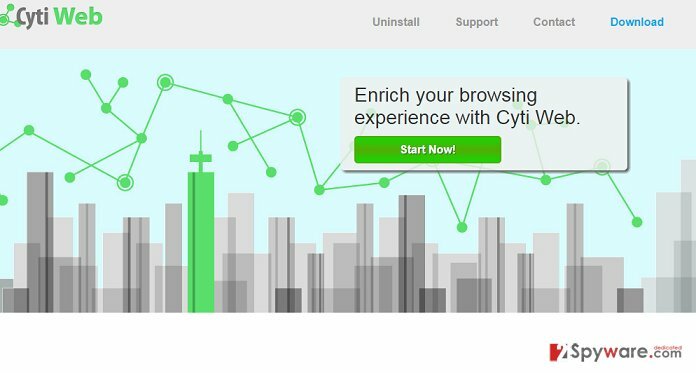 How did you remove Cyti Web ads?